I am writing this a little bleary-eyed after having spent the night under canvas with the children in the Armadillo – our beloved family tent. We took the opportunity to head out for a twighlight ‘spooky’ nature walk, something on Roo’s summer holiday wish list, blackberrying by torchlight (apparently they taste better in then dark), listened in on the bat detector for the chatter of bats and attempted to spot some shooting stars from the annual Perseid meteor shower, which peaked last night. Sadly the large clouds had other ideas on that latter, but the kids didn’t mind. Nothing, it seems, quite beats a night under canvas! Last night was the latest in a whole host of outdoors activities we’ve been enjoying over the summer holidays. We’ve been exploring by foot, bike and outdoors swimming. Fruit picking, on wild days out and all sorts of outdoor adventures. And the summer is still young! 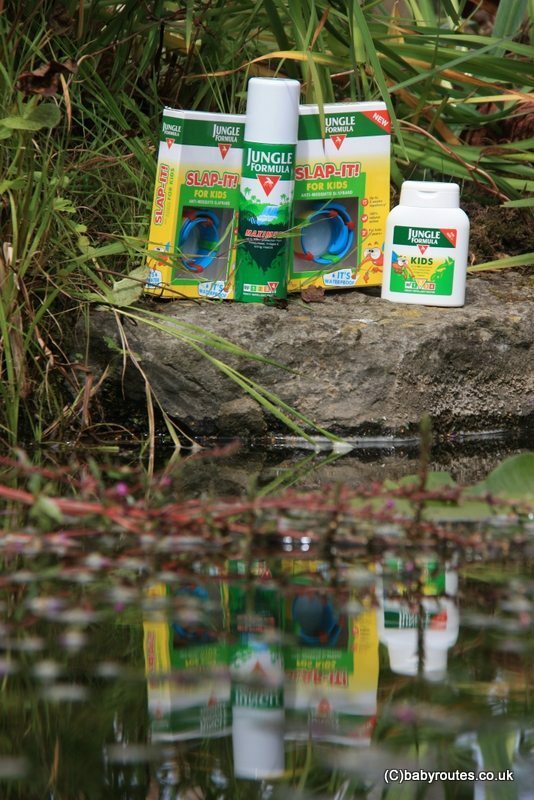 One thing that has come with us on our outdoors adventures this summer has been our Jungle Formula insect repellent. Outside of those trips, I frequently forget to bring it along. Something I have lived to regret on several occasions, with the below picture from a last minute trip to spectate as my hubby competed in a triathlon at Kielder Water just one illustration of this…poor Roo! 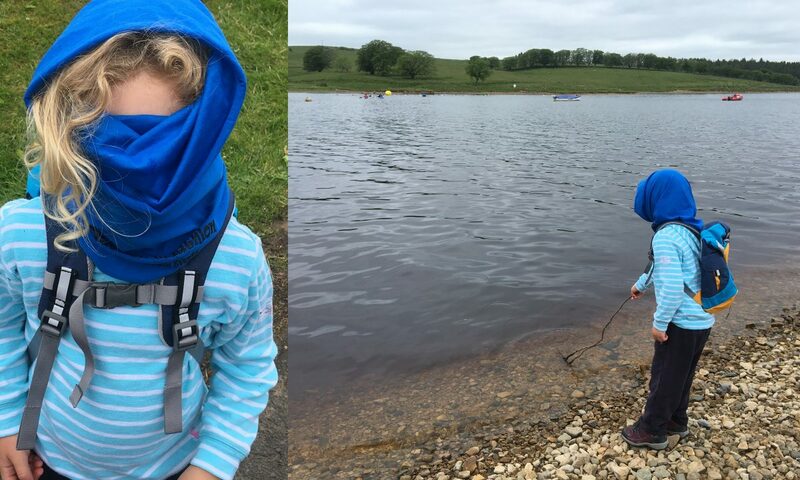 The time we forgot insect repellent…Roo taking extreme action to hide from clouds of carnivorous midgies at Kielder Water! It’s not just midgies that can be a nuisance. After picking up a couple of nasty horsefly bites on a very run-of-the-mill local walk back in June, I’ve been a bit more wary of biting insects. Sand flies, ticks, mosquitoes and other less-friendly native insects are also something you need to look out for and can make your outdoor adventures less fun than they deserve to be. None of these things would ever stop me getting myself and the children out and enjoying nature time. 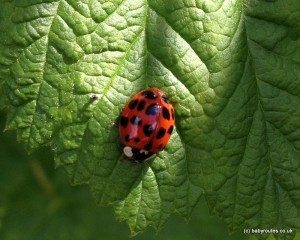 I don’t believe in scaremongering – there are enough barriers to getting kids out in the fresh air and countryside as it is and whilst insect bites can be really miserable for children, they are very rarely serious. What is important is making those outdoor experiences as a family as positive as possible. That way, the kids will take away great memories, a sense of fun and freedom and be champing at the bit to run wild again very soon! 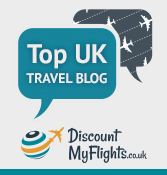 Jungle Formula is a brand I’ve been using for many years now – both for trips within the UK and for holidays abroad. What I didn’t know until recently is that, in addition to their more powerful overseas and adult products, they now also offer a dedicated kids range of insect repellents, designed specifically for sensitive young skin and to be as free from strong chemicals as possible. 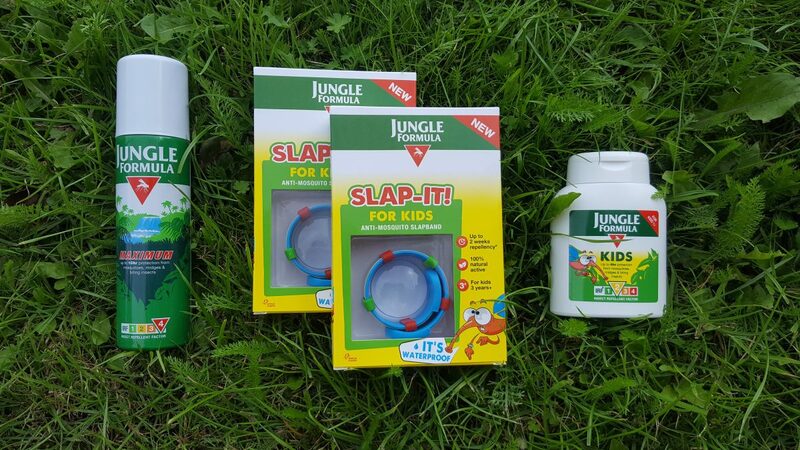 We’ve been trying out the Jungle Formula Kids Lotion this summer along with their Kids Slap-It bands. Roo wearing a Jungle Formula slap band out cycling. The lotion comes in a handy, travel-friendly bottle and is quick and easy to apply. It’s suitable from 12 months plus, is free from DEET and alcohol and offers up to six hours of scientifically proven protection from mosquitoes and biting insects such as horse flies, sand flies and ticks. The Slap-It bands (for ages 3+) are my kids’ personal favourites. They contain 100% natural ingredient Geraniol, which is placed on an insert on the bands away from the skin. 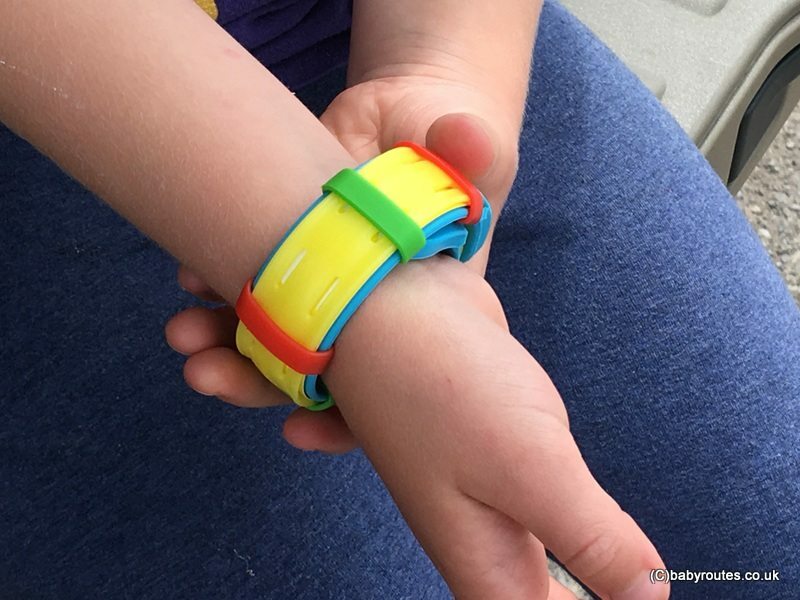 To use, you just tap them onto the child’s wrist or ankle where they convert into a bracelet – just like the super popular slap-band watches and bracelets that are so in vogue with primary school kids right now! This makes them hassle free. Whilst it is recommended that you wear them in conjunction with the Kids Lotion for maximum protection, if you’re off on a general trip out then they provide a good base level of deterrent. Keeping the midgies away whilst biking and blackberrying! 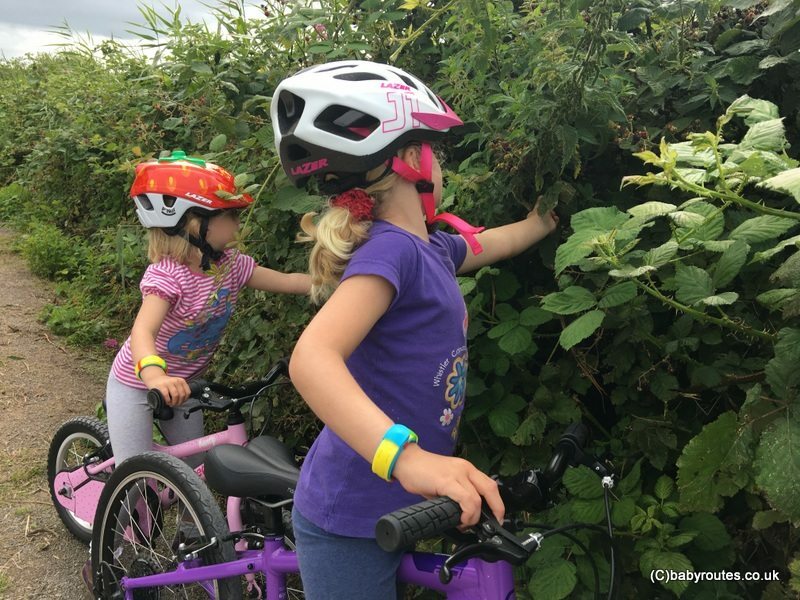 They have particularly come into their own in our household on blackberry picking trips (little hands reaching into the same hedges that are also popular with flying insects), as a precaution on hiking and cycling trips, for use overnight when camping and for use around the pool ( the bands are waterproof). Best of all, the Slap-It bands last up to two weeks and come with a little resealable foil pack to store them in between uses to retain their potency. I can report back that the kids have not had any bites since using the bands and lotion, despite Roo getting two in one day alone the day before they arrived. I’ve even raided their lotion for our twilight walk last night. Win one of three family packs of Jungle Formula goodies! To ensure that your summer is as full of family fun, travel and (bite-free!) 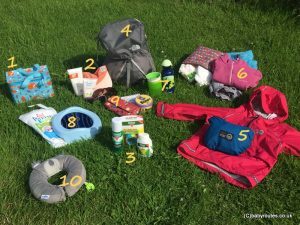 outdoors adventures as ours, I have teamed up with Jungle Formula to give away three family packs of Jungle Formula goodies ! Entering is easy – just let us know all about your favourite family outdoor activities this summer! Post a picture of your favourite outdoor family activities on Instagram with the hashtag #JungleFormula and tagging @BabyRoutes . For an extra entry or two, pop over and visit Baby Routes on Facebook and Twitter – see the widget below for full entry options. Don’t forget to leave your email address and how you have entered on the Rafflecopter widget below. Without it, your entry will not be registered. All entries will be verified. You have until midnight on Monday 21st August 2017 to enter. Three winners will be picked at random shortly afterwards and announced on the blog here and on social media. Full T’s & C’s can be found on the Rafflecopter widget below. Readers should be aware that I was sent Jungle Formula products for the purpose of testing them out before arranging this giveaway. As usual, all opinions, writing and giveaway over-excitement remain entirely my own! 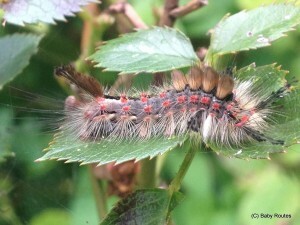 Wildlife Wednesday: It’s National Insect Week! 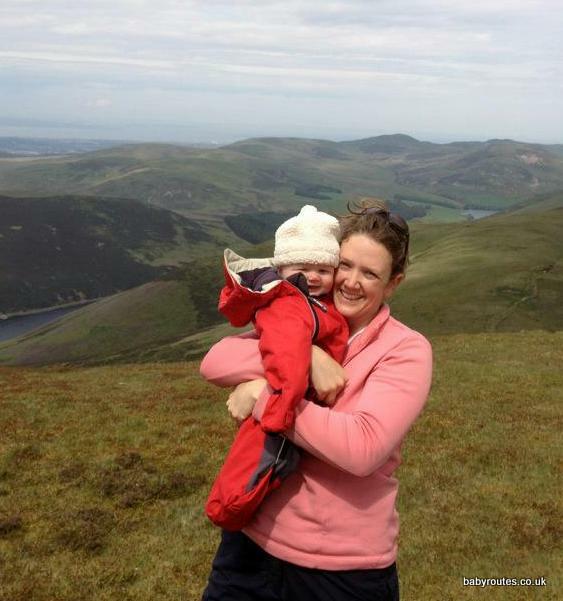 Taking my one year old daughter on her first bike ride and up her first Munro! Trip to Whitby, enjoyed the delicious fish and chips. Great shops. We were lucky with the weather :- Beautiful sunny day. Enjoyed seeing people with their dogs, they certainly seem to enjoy having pet dog. We saw many breeds. Also great pet shop, and managed to get nice treats of toys etc for pet budgie. So family and pet benefitted from our wonderful Summer’s day out. We go hiking in and around the Lake district and then we do some boating. We went a hike up the mountains to tire out the kids lol!! Taking the little lady to the beach for the first time. Its been super-cute watching how excited she gets splashing about in the water! We love going to the park, we go at least twice a week because its our favourite place. Definitely camping! I love it! Going for long walks in the countryside in the sunshine. Walking along the beach, fossil hunting. we like to go pond dipping, Newts are our favorite find. We visit Dino Park and there was fantastic, we had great time, lots of fun! We love to be out walking up hills and moors in the Peak District. A fair bit of camping too! We’re all year round all weather outdoors people! we love having BBQ’s where we invite all our family and friends, even the rain can’t stop us! We have done a lot of exploring our local area, we have had overseas family visiting, its felt like a holiday for us too. Exploring the local woods and getting to know the local area that we live in. We’ve been flying a kite, playing pooh sticks and rolling down grassy banks! Enjoying a walk on the beach with my kids and dog. We love days over Cannock Chase, exploring with wildlife and nature. We take a picnic and ball and have a great family day! We took the kids to the woods and had a picnic with them and the 3 dogs. Was a great day, wasn’t sure who was tired the most though. Looking forward to going to the coast next week too. We’re been building dens in the woods. My youngest loved finding different sized sticks and using our dog as a way to carry them haha. We love spending time outdoors as a family. We are regularly to be found trekking around the countryside, going off the beaten path and generally exploring! We love hill climbing and rambling too. a trip to the country park and the ziplines. Long days at the Beach with family and dog- great walks and fresh air!! Walking and at this time of year picking blackberries. We’ve had some great water fights! We have had some super times in the swimming pool this summer. A walk looking for wildlife or simply taking a ball to the park. Keeps them entertained for hours! We loved glamping in the Scottish Highlands but hated the dreaded midge. We could do with this for when we go back next year we love walking in the Highlands. Achmelvich Beach was also amazing. We’ve been loving a good old walk around the local forest. Good on rainy and sunny days. We love going to the beach! Family bike rides,going to the beach and friends and family bbq’s (weather permitting). Determined to combine parenthood with her love of travel and the great outdoors, Kate founded Baby Routes in 2012 after the birth of her first daughter. 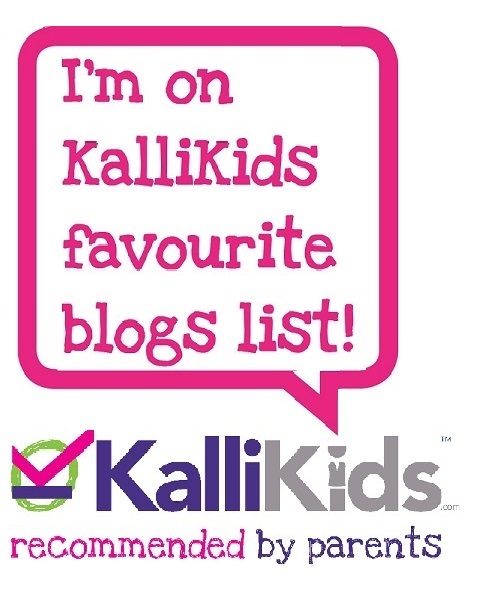 Now with reception & preschool age daughters & a baby boy to take on her adventures, Kate continues to test out family friendly walks, share travel tips and put outdoor gear for parents and tots through its paces.